Reminder June's Virtual Tasting will take place on Wednesday June 30th at 7pm. Read more about it here. This past weekend I had the opportunity to participate in a panel discussion on the Washington wine industry at the 2010 Wine Bloggers Conference in Walla Walla. In an all-too-short forty minutes, co-panelists Paul Gregutt (Wine Enthusiast, PaulGregutt.com), Coman Dinn (Director of Winemaking, Hogue Cellars), and I discussed Washington's viticultural areas, weather patterns, most important grapes, and recent trends. 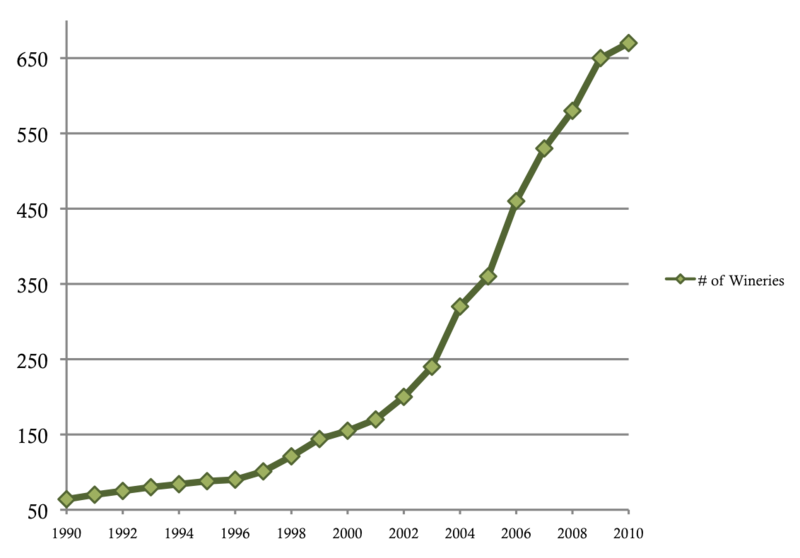 Here is a summary of the material I presented on recent trends in the Washington wine industry. Without question the most significant development in the Washington wine industry in the last ten years has been the dramatic increase in the number of wineries. Washington ended 1999 with 144 wineries. By 2010 that number is over 670. One in every hundred wineries in the U.S. is located in Washington (Erratum: Washington is home to one in every ten wineries in the U.S.) with one in every six of those wineries located in the Walla Walla Valley. 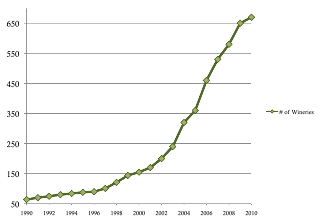 While the rise in the number of wineries in Washington has been dramatic, it is interesting to note that this mirrors a national trend across the U.S. in the last ten to fifteen years (data from www.wineinstitute.org). Along with an increase in the number of wineries in the state, Washington has also seen a string of exceptional vintages in the last ten years, with each vintage seeming to build on the last. 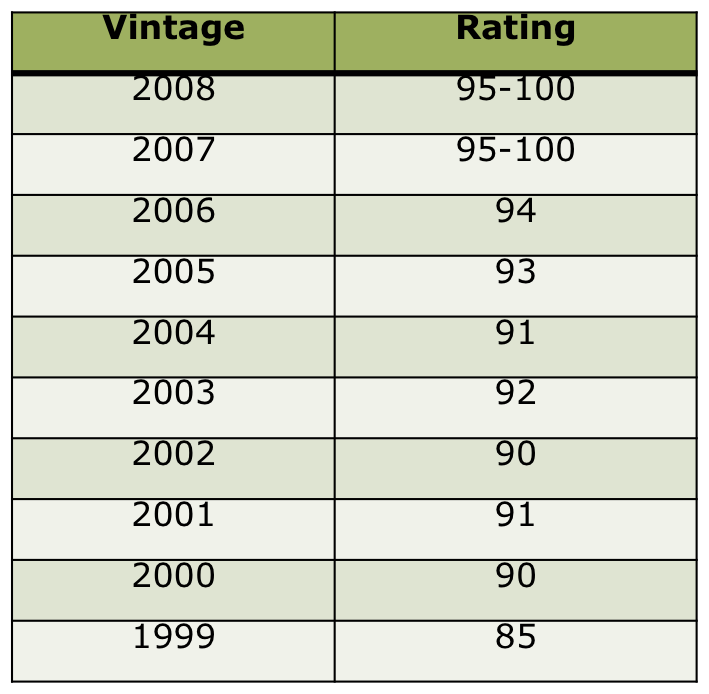 Vintage ratings from Wine Spectator show a steady increase over the last ten years with 2007 and 2008 showing near perfect conditions. This, along with better winemaking skills and improved viticultural knowledge, has resulted in an increase in the quality of the wines being produced in Washington. 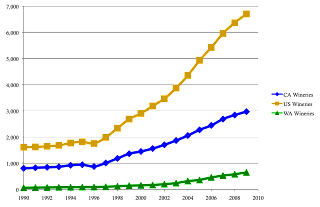 Washington has also seen increasing national recognition in the last several years. In 2009, Wine Spectator named a Washington wine its 'Wine of the Year'; Wine Enthusiast gave a Washington wine a perfect 100-point rating; and Food & Wine Magazine named a Washington winemaker its 'Winemaker of the Year.' These accomplishments would have been almost unthinkable ten years ago. Additionally, there has been a steady rise in the number of highly rated wines being produced in the state and also the ratings of these wines. To wit, prior to this year, Wine Spectator had never given a Washington red wine a rating higher than 96 points and only a very small number of wines had received even that rating. 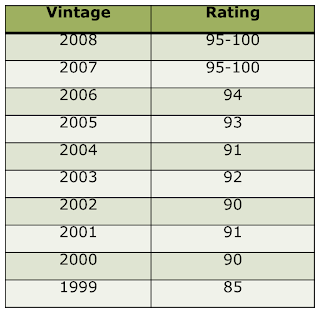 This year, it has given three Washington red wines 97 point ratings, and the year is only half over. One of the fascinating things about Washington is that the majority of wine production comes from a very small number of wineries. One winery accounts for twenty-five percent of the wine produced in Washington (Columbia Crest). Thirty-seven wineries account for ninety percent of the total production. In contrast to these large players, most of the wineries in Washington are very small. Of the state's 600-plus wineries, over five hundred of them are producing less than 4,200 cases annually (extrapolated from data from the Washington State Liquor Control Board). Many of these are small, family run wineries. While the last ten years has seen tremendous success in the Washington wine industry, there remain a number of challenges. The small size of many of the state's wineries makes it difficult to distribute widely. With only, say, three hundred cases of a particular wine being produced, wines are often difficult to find inside the state let alone outside of it. Onerous state-by-state regulations are a significant burden on the state's small wineries, costing large amounts of money and depressing national sales. Surprisingly, despite the many accolades, Washington still suffers somewhat of an awareness problem. While people who are keenly focused on wine know that something interesting is going on here, the wider audience that is important for Washington's national 'brand recognition' (and sales) still largely do not. Indeed, many people still have no association with Washington as a wine producing state. This seems surprising given the omnipresent wines of Washington industry champion Chateau Ste. Michelle. However, despite Chateau Ste. Michelle's wide brand recognition, many people do not associate the winery with Washington, believing instead that the winery is located in California. Additionally, when many people think of Washington, they don't think of Washington State but rather they think of Washington, D.C. This is particularly true on the east coast. Paul Gregutt documents in his Washington Wines & Wineries: The Essential Guide a well-known story from Bob Betz, now of Betz Family Winery. Betz was working for Stimson Lane (now Ste. Michelle Wine Estates) and traveled frequently to tell people about Washington's wines. After giving a talk where he described the state and its wine history to an apparently engaged audience, someone asked, "Which side of the Potomac did you say the grapes were grown on?" While comical, many years later this remains somewhat of a problem to Washington's overall branding. However, the increasing amount of recognition the state's wines have achieved in recent years seems sure to make this problem largely go away in the near future. The last ten years have represented a tremendous turning point for the Washington State wine industry. What might the next ten years look like? A few questions that it will be interesting to learn the answers to are: How big will the industry grow/How many wineries can Washington support? Will Washington establish a 'signature varietal'? If so, what will it be? What role will emerging varietals such as Malbec, Grenache (and associated blends), and Tempranillo have? Will Washington continue to have many small wineries and a few large ones or will more mid-size wineries evolve? How will Washington reach across state boundaries to establish a greater presence nationally and beyond? Without a crystal ball, I can't say what the answers to these questions will be. But I can say that it will be fun to find out.